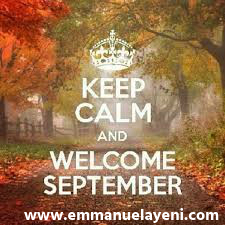 It's a great day and welcome once again to the month of September. Thank God for the precious gift of life. The year is gradually winding off and it's so easy to either be complacent and allow time to just slip bye or to be so worried about the passage of time and lose focus on your unachieved goals. The right attitude today is to stay in the moment, taking stock of the past eight months in the light of your goals, setting new goals for the month and making daily action plans to follow through. There is Greatness written all over you!